Outdoor Research Aurora bivouac sac open. I bought the Outdoor Research Aurora bivouac sac in the outdoor store called Bivouac in Auckland when I planned to go into the wilderness of New Zealand. Given that it is quite different to sleep in a bivouac sac than in a tent I had an informative talk with the shop owner beforehand and I will tell you about this and the following first hand outdoor experience with the bivouac sac. 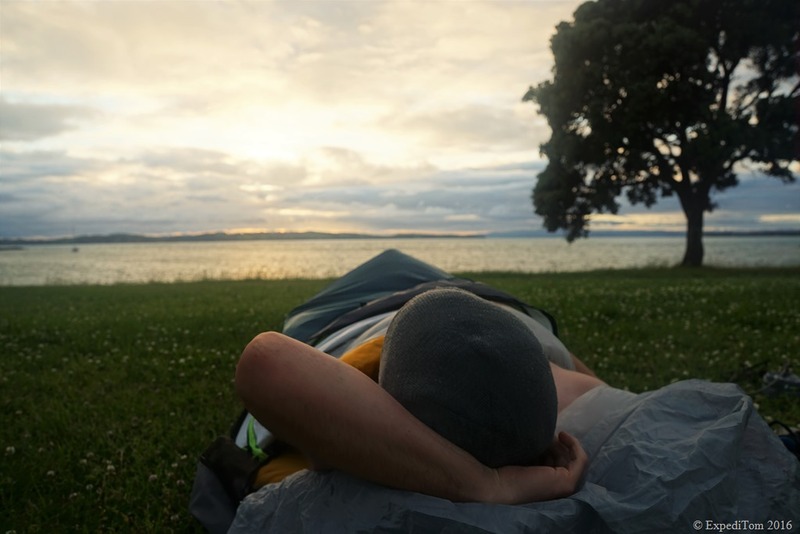 Waking up in the Outdoor Research Aurora bivouac sac on Motutapu island. But first to the technical description of the Aurora bivouac sac – short bivy. 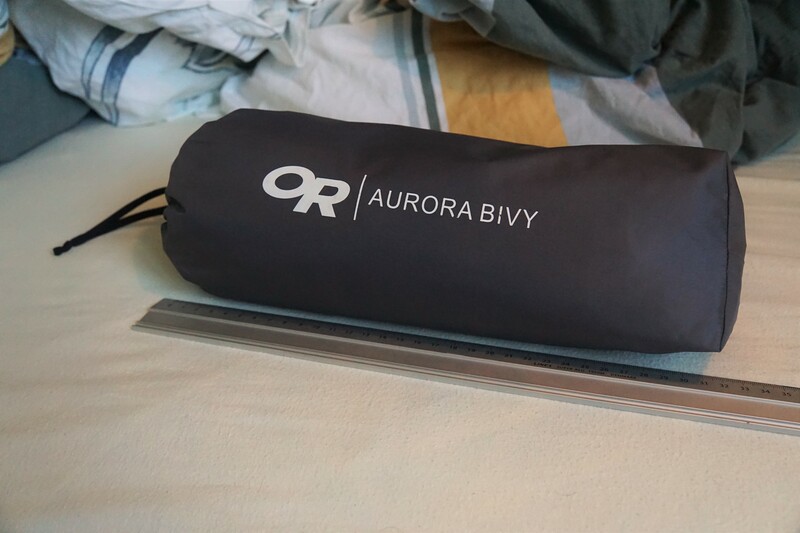 The Aurora bivy is generally speaking just a waterproof bag with a zipper to close. It is made out of ripstop nylon. Whereas the bottom tier is waterproof non-breathable fabric, the top-tier uses waterproof breathable Gore-Tex® material. The inner fabric of the Gore-Tex® looks and feels like a fine-meshed net which allows it to soak up moisture and let it through the membrane. At the top of the Aurora bivy is the entrance with one zipper to close it fully, and another to close only the insect shield. There are 2 zipper sliders each, thus you can open both zippers as you like from left to right or vice versa. Additionally, there is a small pocket inside the bivy where you can store your keys or whatever. If you close the Aurora bivy fully, the top tier overlaps the zippers and therefore water should not enter the bivy. I read somewhere in the internet that the breathable Gore-Tex® fabric will let enough air through that you could sleep with a fully closed Aurora bivouac sac without any problems. Furthermore, on the side of the Aurora bivy are in total 4 micro straps to secure it with pegs to the ground if necessary. Despite the Alpine bivy of Outdoor Research the Aurora lacks a pole to hold the top fabric from lying on your face. Outdoor Research Alpine bivy with pole. Outdoor Research Aurora bivy without pole. Measurement of the Outdoor Research Aurora bivouac sac. The biggest advantage of the Aurora bivouac sac is its weight and measurement when packed. Weighing only 625 grams (although Outdoor Research claims the bivy to weigh 665 grams – why is mine even lighter? ), the Aurora bivy is a perfect companion for ultra-light hikers. Additionally, it measures just 32 x 12 cm in the included transportation bag which comes in handy. All seams are taped and it is therefore totally waterproof. 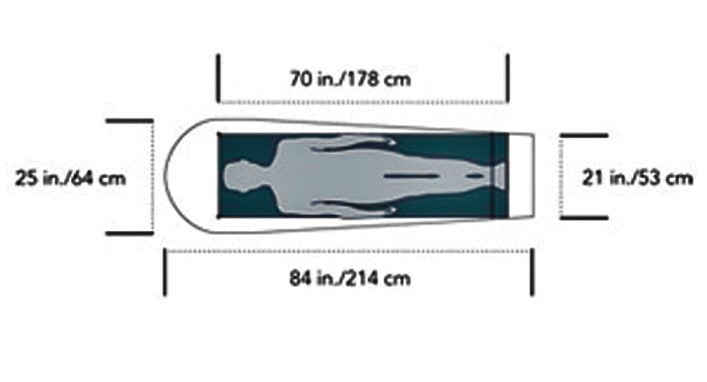 According to REI the bivy might increase the warmth of a sleeping bag to up to 10 degrees, although in my experience the increased warmth was not even a few degrees. I realised this because there was that particular night when the temperature plummeted to 3°C and I felt cold in my Sea to Summit Spark II down sleeping bag which has a comfort rating down to 6°C. As a result, I do not believe the bivy added any warmth worth mentioning. Nevertheless, the breathability and waterproofness in general was astonishing. I expected the fabric to feel extremely wet in the morning as I was used to in a tent when you touch the wall, but far from it. Although the Aurora bivy is basically a single walled tent, the fine-meshed inner top fabric does a great job in keeping moisture out of the bivy and I rarely felt any condensate. Only once on a wet morning, where a lot of dew impaired the breathability, condensate appeared above my head. Moreover, the Aurora bivy has a great colour which is stylish and at the same time doesn’t look dirty after several trips. One can say, it hides the dirt quite well. Additionally, the high quality nylon fabric showed no sign of wear despite heavy use in various conditions. The morning after the particular cold night. 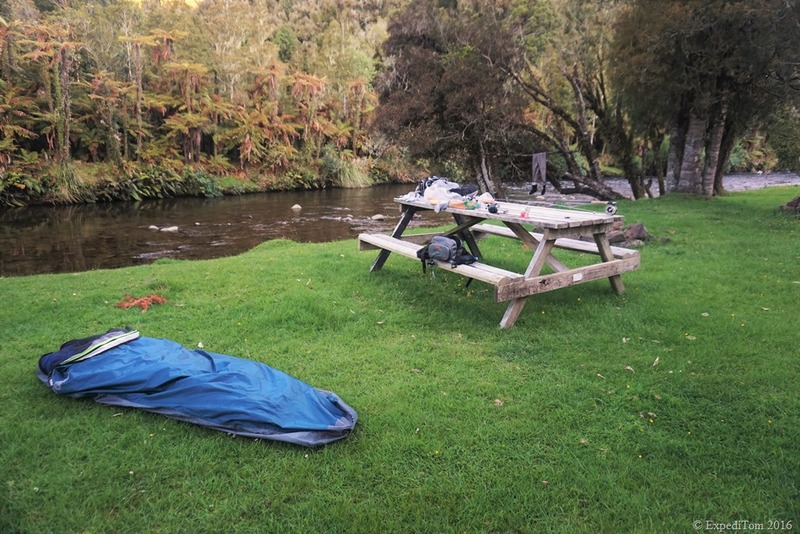 Camping spot in New Zealand with the Outdoor Research Aurora bivy. Having written about the positive aspects of the Aurora bivy, I now want to turn my attention to the drawbacks. First and foremost, a bivy is not a tent. This might sound preposterously to mention but most limitations are due to this fact. For instance you’re not able to take more into a bivy than your sleeping bag, Thermarest neoair mattress, some clothes and minor gear such as your lamp or silk inlay. Your 60 litre backpack will not fit in there. In addition, you do neither have a covered space to put your shoes under nor the rest of your gear. Needless to say, there is as well no place where you could change your clothes under a shelter. Furthermore, despite all the wonderful waterproof and breathable fabric: You might get a little wet! As I mentioned above there can be condensate in the Aurora bivy under certain circumstances like heavy dew. Another issue I had, was when a heavy downpour flooded my sleeping place (I should have known it – I put myself on moss – ’cause it was so fluffy). Given that I did not close the zipper fully to get enough air to breath during the night, water began to flow into the bivy. Suddenly, I realised that I did not dream about swimming. This was on the one hand my fault because I chose a bad place to bivouac but on the other hand the Aurora bivy would be more resistant against such flooding if the edge was stiffer built, so the zipper can not lie directly on the ground. However, my sleep comfort was generally very good, although one thing you might dislike is the fact that the top-tier lies in your face when you sleep on your back. I think it would have been better if Outdoor Research had made a opportunity to use a pole if necessary, so everyone could decide for themself, whether they want to carry the extra weight or not as it is with the alpine bivy. Dew in the morning on the Outdoor Research Aurora bivy. All in all the Outdoor Research Aurora bivouac sac is a useful companion if you want to go as lightweight as possible or just carry it as an emergency shelter. Nonetheless, it does not replace the comfort of a tent. While sometimes still building condensate, a top fabric lying on your face and limited space – it is nothing for people who feel uneasy in tight spaces or can not deal with the moist. As a result, I can recommend it only to all the outdoor enthusiasts out there who are looking for light gear and know how to cope with the hardships I pointed out. To finish this review I can’t stress the point enough that sleeping in the Aurora bivy under the stars is a liberating experience. 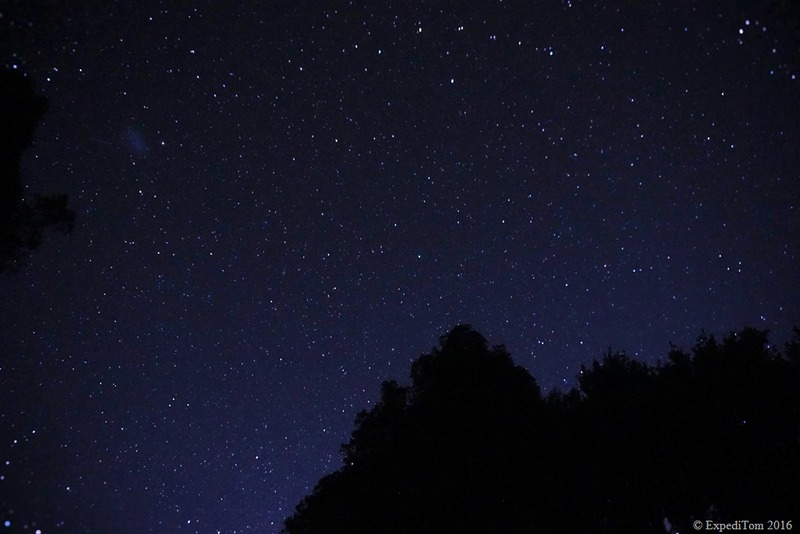 Liberating feeling to sleep under the star in the Outdoor Research Aurora bivy. 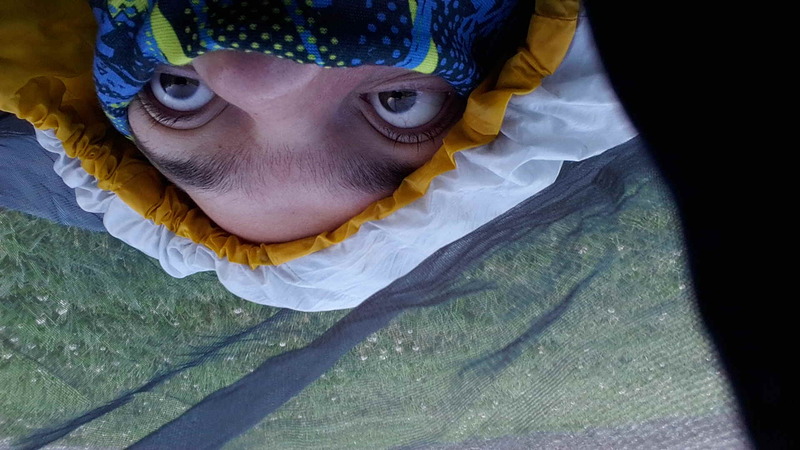 Have you ever slept in a bivouac sac? What was your experience?